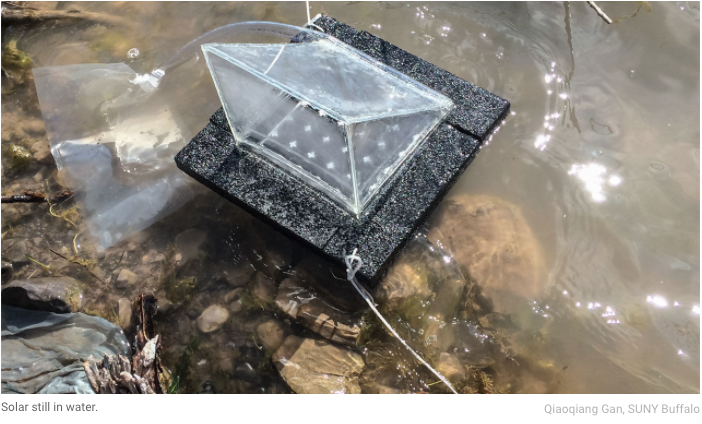 A group of engineers at the A. James Clark School of Engineering at the University of Maryland having been developing a new use for solar energy that addresses water scarcity. Using natural processes, the researchers found a way to purify water by transporting it through wood with the use of solar technology. 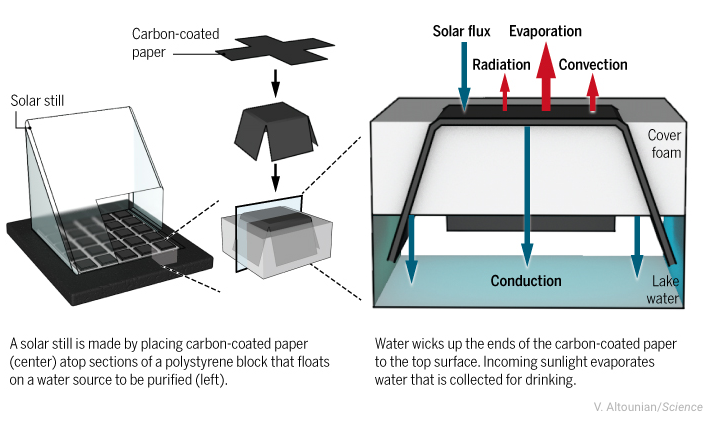 The technology works quite simply- a small piece of wood sits on top of unpurified water. The side of wood facing up towards the sun is be darkened, either with carbonized wood (basically burning the top layer of wood) or with lab-produced carbon nanotubes or metal nanoparticles. There is a still a question of the cost-effectiveness of this material. “Efficient light-absorbing nanomaterials can cost hundreds of dollars per gram, making them unrealistic for widespread use in developing countries where the technology is needed most.” explains ScienceMag. Once one side of the surface of wood is darkened, it sits in the water as the sun heats up the surface. The water below is drawn up to the heated surface through the wood’s porous structures where it is then evaporated and collected in a contained system. ScienceDaily described the simplicity of the purification process: “The salt or other contaminants are too heavy to evaporate, so they stay below.” The water then trapped in the system is cleared of harmful contaminants and can then be converted into potable water for communities. Besides wood, other researchers and engineers have been looking into other economically viable materials. Qiaoqiang Gan, an electrical engineer at SUNY Buffalo, found that carbon rich paper coated with cheap powder leftover from combustion of oil or tar as well as polystyrene foam can be combined to make a device that is 88% efficient in collecting water from channeling the sunlight’s energy. The materials are strategically layered to create a insulating technology that allows just enough sunlight to get to evaporated water funneled into a collection vessel. It is interesting to see how renewable energy technology is not only used to reduce our reliance on fossil fuel sources, but also to combat other social issues prevalent all over the world. This exemplifies the diverse uses and applications solar technology has on our planet. While using solar energy to solve the issues around water scarcity is still in its early stages, research thus far has shown it has a lot of potential. As soon as cost effective material can be accumulated and produced on a large scale, this technology can be incorporated into communities in need of fresh water. This technology has tremendous potential, and it will be interesting to see how it can be incorporated into communities in an economically viable way.